We’re having some classic Austrian weather right now. It’s been rodding it down since 5am. I’ve been eating Egg And Chips enough times for it to lose its special status. Most everyone else is caving at the minute. I haven’t seen Becka in 5 days. I’m waiting for better flying weather. This is a great time to get some work done on these pesky stay-down linking in the Adaptive algorithm. 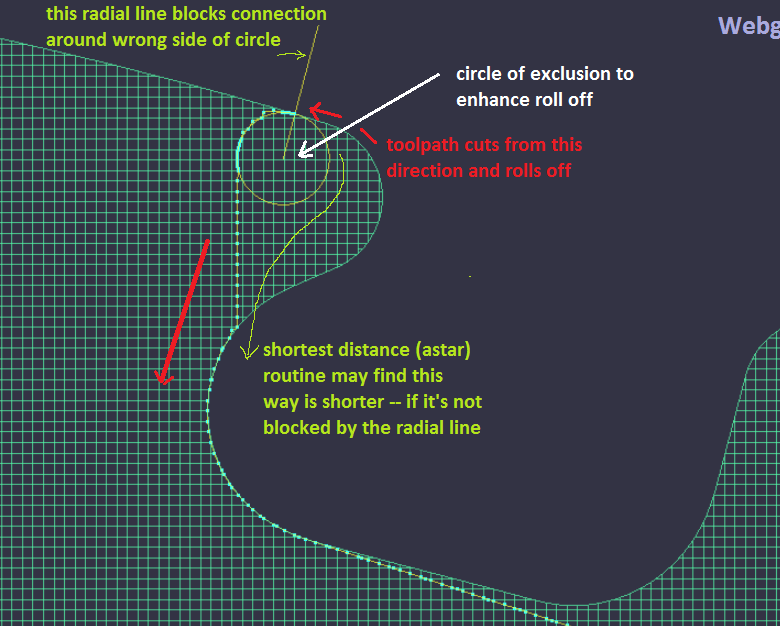 Here is an example of the A-star linking path calculated in its setting of the rest of the cutting toolpaths, so you can see how it fits in. The path must traverse through the area without colliding with material that hasn’t been cut yet. This image is of the first iteration. There’s a secondary process which pulls the path of light blue dots tight within its structural matrix once it is connecting in the right direction. What I mean by the right direction is the way that the path rolls off the preceding path and rolls on to the next cutting path. I can calculate the shortest path reliably now, but it would sometimes result in going 180 degrees back on itself if it’s shorter to go round the circle, so the trick is to artificially insert a circle of exclusion that it has to avoid as it finds its shortest trajectory. This worked well most of the time, except that the path would sometimes go the wrong way round the circle. It doesn’t know any better. It just finds the shortest path which it can. So I inserted this radial blocking line to block off paths that started off the wrong direction. 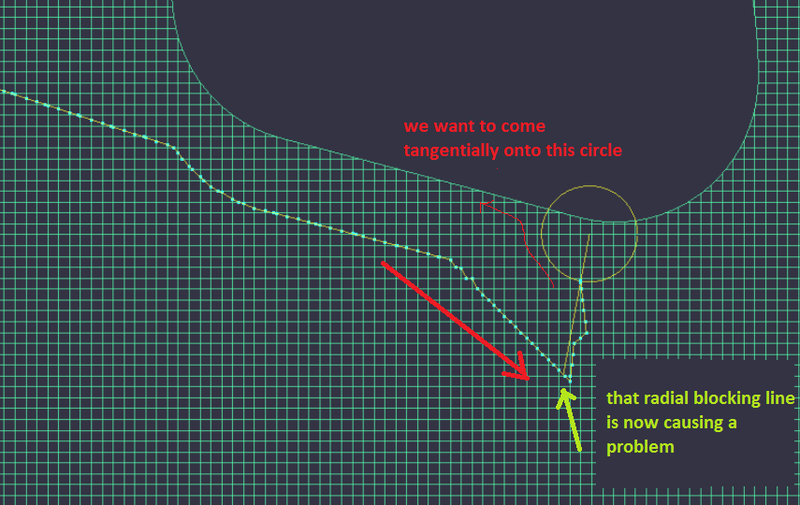 And of course sometimes the radial line becomes a liability and the stupid shortest path thing has to go all the way around it when it should be coming in to the path nice and smoothly. I just worked this one out this morning. It takes ages to discover these errors in the data, looking at unusual tool motions in real examples, and trying to separate them out into the debug development environment so they can be analysed and plotted. In computational geometry, if you can’t see it, you can’t debug it. 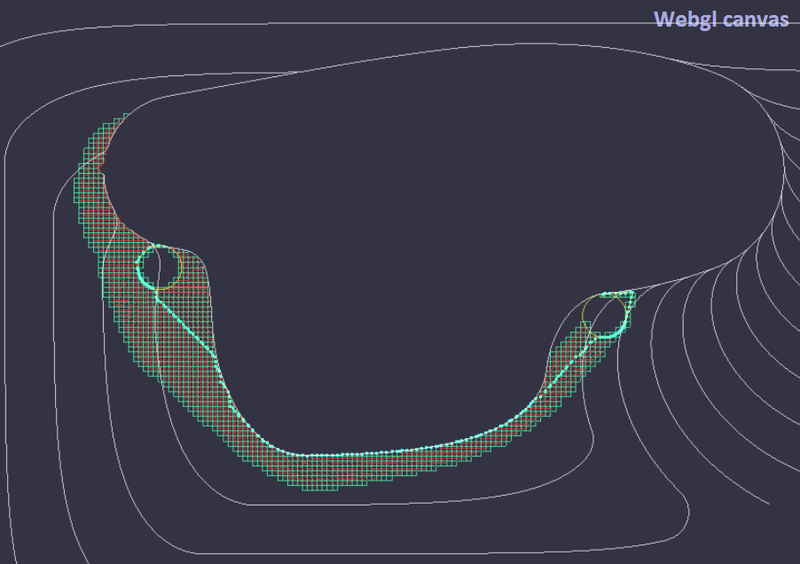 In the real world you’d hope that a corporation that depended on vast quantities of computational geometry would have a dedicated team helping programmers visualize their messed up algorithms, so they don’t have to hack up crazy things like my “webgl canvas”. I’ll spend the rest of the day getting to the root of this one, I guess, and then be one insignificant step closer to finally getting this out of the way. I don’t deserve to enjoy any flying until I do. Nor do I deserve another egg and chips. I could spend ages reminiscing about the last three days of flying, but then I wouldn’t get any work done. I do now have a dozen gigabytes of video on the disk to be archived. Maybe it is something I will watch in real-time on a big screen when I am old and crumbly. Here’s a nice edited video of Flight#2. More interesting than most as it was often close to terrain. After this I walked back up the hill on foot to get the car. It took 2 hours. 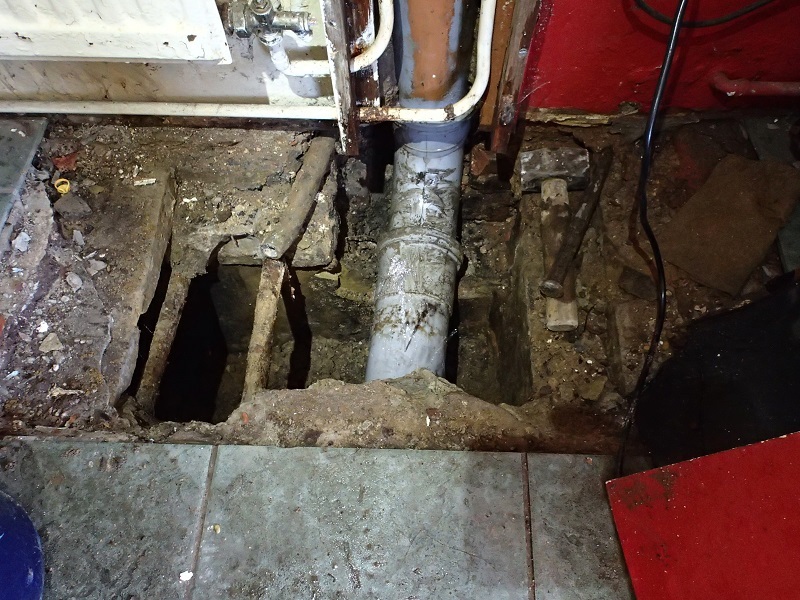 The internal downpipes from the roof in our house have caused dampness and other problems for over a year. I finally found out why after I noticed it was leaking six hours after it had stopped raining. First I chiselled a hole through the floor and discovered a void underneath where we thought there was bedrock. No wonder it’s so cold in this house all the time. It’s now a long term project to entirely remove the floor and insulate it. At some point I’ll have some more interesting things for reading about, but at the moment all I’ve got are fun things for me. 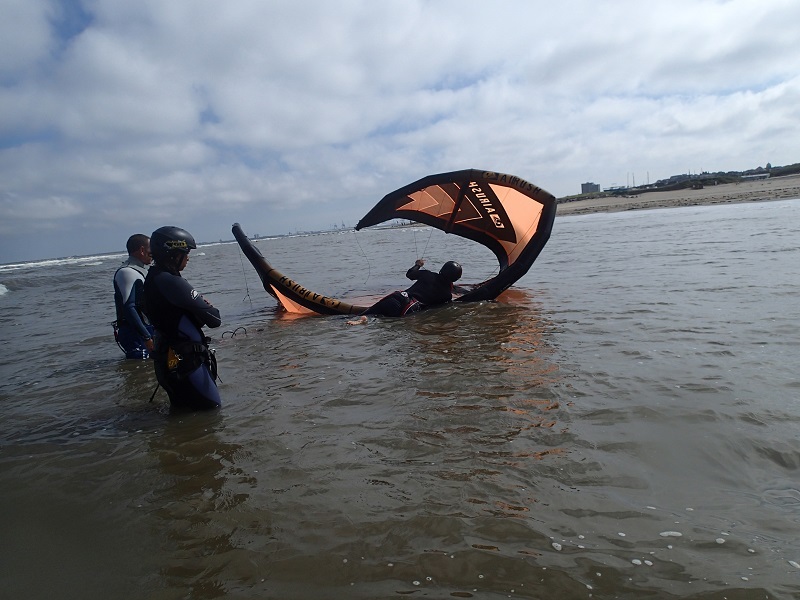 This includes another semi-successful quick kite surfing lesson in very light winds where we learnt how to do an emergency pack down of the kite. Then I hang-glided on two consecutive days. Thursday was overcast. I flew around for three hours mostly alone not far above the ridge. Just filling in airtime. And then Friday was no wind. Everyone was standing around in the sunshine and gassing to one another. I’ve seen this story before. Pretty soon there’s going to be one big thermal and lots of wind. People are going to let it pass, then get ready and wait for the next one… and there won’t be a next one. This has happened to me about half a dozen times. I don’t care how hot it is. I got ready and on the front to take my chance. I’m not afraid to go down if I get it wrong. It’s better than having to pack up at the end of the day having not flown. And for once I got it just right! Except of course I glided straight back down and walked back to the hill for 8 miles until one of the other glider’s cars found me and picked me up. I’ve now ordered a copy of 50k or bust to tell me what to do next. 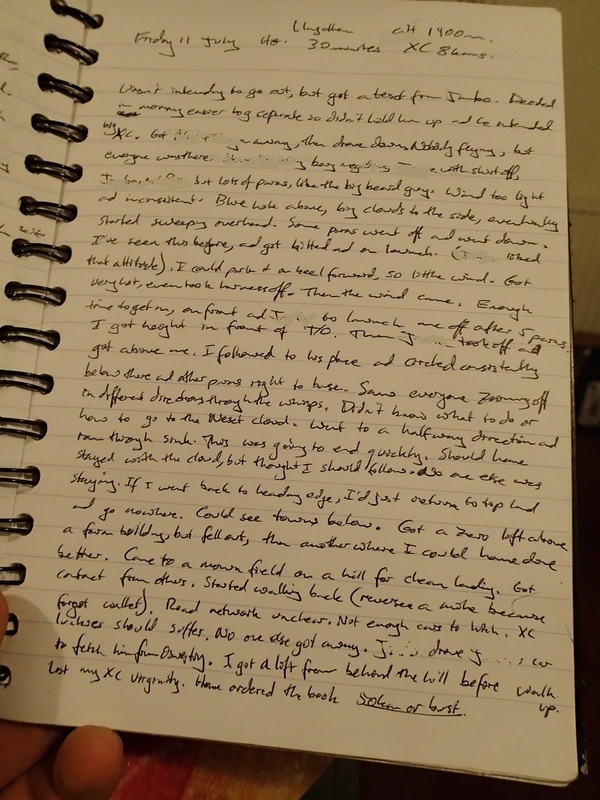 I’ve trouble enough keeping my logbook up to date, so here is a page from it with names of the guilty removed. Now I’ve got a week of potentially doing useful stuff before going to CUCC Expo in Austria. 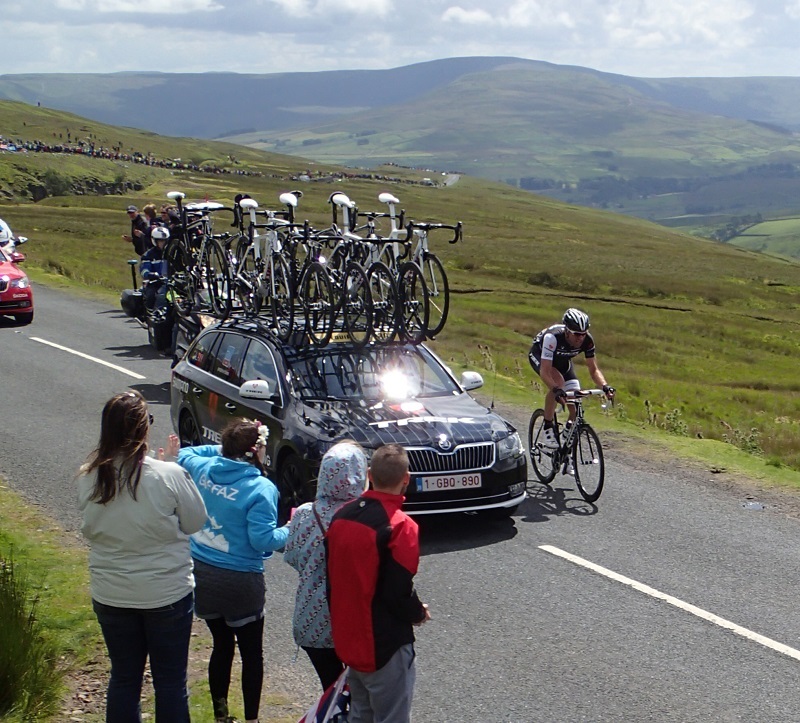 The Tour de France did their first stage through Yorkshire, crossing Buttertubs north of Hawes. This is quite a long way from Bull Pot Farm where we stayed, so I got a lift most of the way out and completely failed to find Becka and the others on the hill. (Luckily, I was carrying the lunch.) Who knew there would be such an incredible crowd and no phone signal on such a bleak moor? 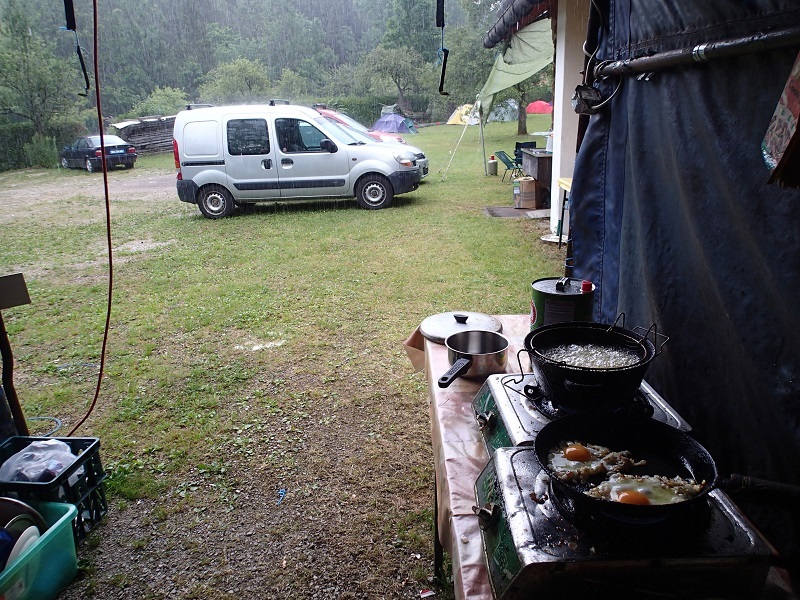 It was more packed than the Col d’Aubisque when we saw the Tour three years ago. The ridiculous caravan was the same, albeit shorter and with not so many freebies being chucked out. 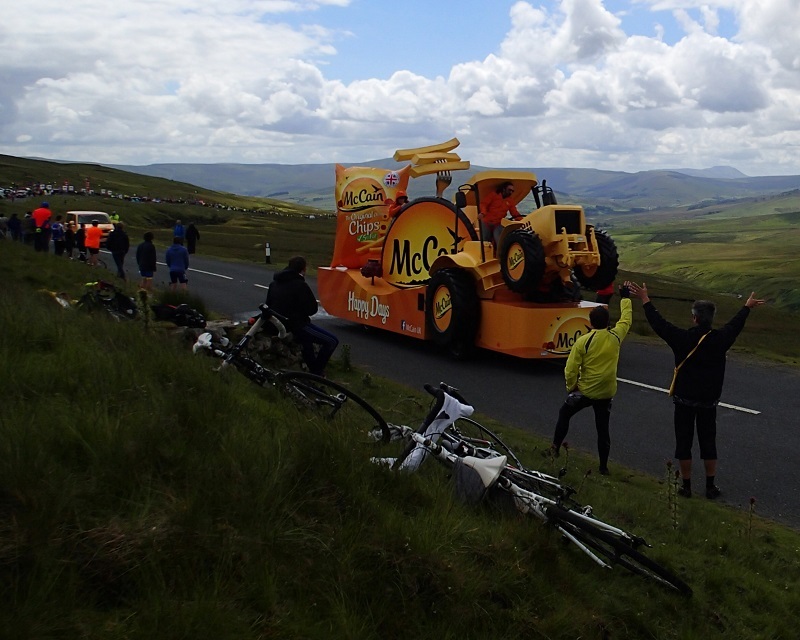 You got to admire that corporate consumer product sculpture that gets paraded all up and down the countryside. It was a really biting cold wind in the open. At least it blew the midges away. Take your pick. It’s a bad year for midges. The leader Jens Voigt came through much earlier than the pack, ten minutes after an unexplained flyby of four helicopters. This was further up the hill from the real packed crowd on the steep bit where there was barely any room for the riders to squeeze through. Then it was time to clear the hillside. It became apparent that every man and woman that owned a fancy bike anywhere in a 200 mile radius was on that road trying to get off at the same time. 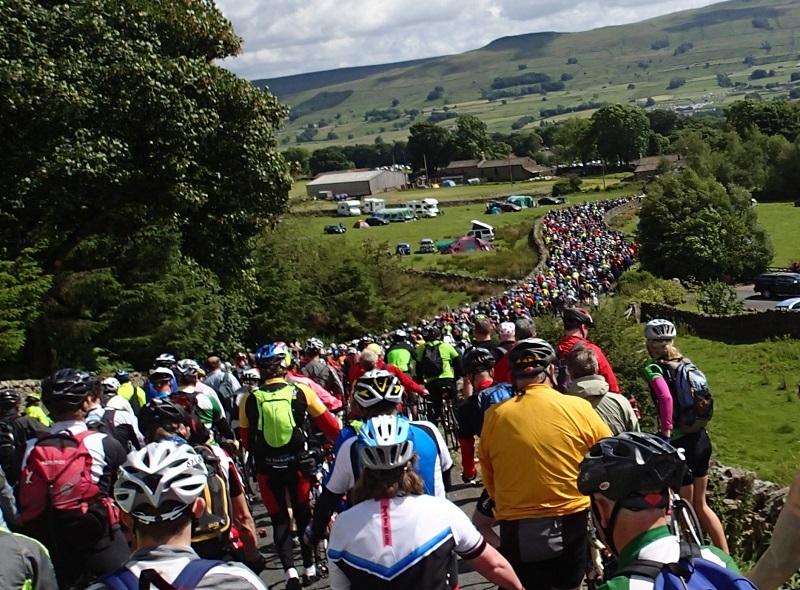 All the cyclist spectators overtook me on the road back to Ingleton in a steady stream, because I’m really quite slow. There were no other cycles on the stretch back to the farm: just me. Some DVDs of the live race had been burned and driven up the track by the time I got there, so we could watch the whole race and all the stuff we’d missed while we had our tea. Apparently that’s the real way to do it: sit in a cafe or pub on the route watching the live race on the TV, then step outside for the split second it goes past in real life, then get back in and carry on watching on the screen while you enjoy your beverages in the warmth.